It's possible, although that midfield combo has been Klopp's go-to for the big games this season, so it seems reasonable to suggest it was a continuation of what we've seen previously. It's very much the Ronseal of midfields. You get exactly what you expect. Fabinho is a bit of a maverick, he could easily of done an early gamble leading to a goal and Klopp wanted to avoid that. Keita is exactly the same, he has his moments of brilliance but he is also a liability at times. I think Klopp starts the big games wanting a 1-0 win, a lot of the time its our front line fluffing their lines stopping that. Henderson whilst not to everyone's taste very rarely gives away the ball which results in a chance for the opposition. We assume everything is equal between players - like we’re picking between players who have all got 100% fitness on footy manager. Could it be that Klopp is looking as his resources post international break and going with his three fittest lads? Hendo barely got a sniff, Milner is retired, and Gini seems to naturally able to play three games a week easily. Klopp might consider Fabinho a starter, but in this case thought it better to limit him to 30minutes. I gave it a thought but I think that evidence is there to support claims of Klopp favouring this particular trio. I think there was only one game in which Fabinho wasn't fit enough to start (some time around New Year), the rest of them was Klopp sticking with his hard-working, zero-creativity midfield. Fabinho surely didn't look like a player lacking fitness or rest against Tottenham. For arguements sake.. Do you think we win the game like we did against Bayern if Henderson didn’t go off injured and Fabinho comes on? We'll never know but I think Liverpool simply play better with Fabinho. I'd never wish an injury on any player, let alone a Liverpool one, but I was mightily disappointed to see the dreaded midfield trio start both games. I don't see any of the three as a problem, just the three of them together. My opinion is that Fabinho and Wijnaldum on this form should be regarded as Liverpool's best mdifield pairing - whether it's Henderson or Milner missing out, that's for another discussion and it probably depends on the rest of the side, as well as the opponent. Tactics has to play a big part in players selection as well. Fabinho gives a solid anchor at the back but trio of Hendo, Gini and Milli looks more fluid and dynamic. In the first half of the Tottenham game, everything went right for us, we had our backs bombing forward and we should have scored more and have the game won by half time. Come the second half, Poch changed his tactics and it was back to equal footing with both teams having chances but we no longer dominate. Yes Fabinho/Origi coming on for Hendo,Milli showed we wanted to go for win. Fab did well coming off from bench winning ball back and providing us with the base for our next attacks. Even so we were always gonna get caught with the counter and it took a phenomenal VVD to stop Spurs getting the lead. We were fortunate to win with that OG when the game could have gone either way. Have to trust Klopp to rally the boys fer the next game and whichever midfield he chooses, the team will set out for the win. Nothing else matters and hopefully we can extend this record of 32 Played - 24 wins 7 Draws 1 loss. He played 20 minutes, that's why. Klopp spoke recently about Fab being tired and wanting to get him a rest, but not being able to. Coming back after the international break, I suspect a big part of this selection was simply those were most physically up for (Hendo and Gini always are if not injured and Milner had a break). I think you've got good reasoning except Klopp tends to go with that three man midfield for all our big games against top teams. Fabinho wasn't good at Fulham and he was out on international duty. Spurs are no idiots themselves, technically a fine side, probably better than us in that aspect. Though in my opinion they lost that midfield battle with Sissoko playing the deepest role (trying to employ a sort of diamond with Kane acting deeper), with both Winks and Dier out and Wanyama out of fitness and form. Fully understand why in that case we went for our most experienced trio. Hendo played well in my opinion, Gini was a bit weak, so we'll see if at Southampton both Fabinho and Hendo start. Gini might be needed on Friday in terms of style with Southampton's huge energy. Maybe Millie sits out and gets a start against Porto. We'll see. Keita needs to improve and we'll see what Ox is able to do after this injury. It's probably too late in this season for them to catch serious form, I'm just hoping that they can provide a bit of quality off the bench or with a rare start here and there. Pre-season and next season hopefully we get answers to those questions. Keita needs to improve and we'll see what Ox is able to do after this injury. I sure hope he can get back to that level of his game, and improve further under Klopp. This fella for me is better than Keita at all fronts. If anyone can confirm this, I'd be very grateful. This thread doesn't make for a good reading for the midfield trio of doom. Won 2, drawn 6, won 2? Can confirm this guy has been on the ale. We've only lost 1 so it isn't even a typo, I'm not sure what he means. That midfield clearly is clearly not the answer but those stats will also be skewed by the fact that that midfield is generally used against the best opposition and often away from home too. If we were using it against Cardiff, Fulham, Huddersfield etc at home they would probably tell a different story. This year and last year but yeah. We use that midfield against the top teams so it'll always look worse viewed just that way. Oh aye, didn't see that. Thought they'd have played more than 10 games in the league together over the last 70. Last season Coutinho and Ox were used a lot as 4th attacker/3rd midfielder. We've not had a similar option this year except maybe bringing Shaqiri on the right so Firmino and Salah can both play centrally. Keita and Lallana are the options, problem being they haven't been as consistently good as Chamberlain (and both have had fitness issues). We could also use Origi wide left and drop Bobby back as we're doing now to good effect. Ox's status has definitely grown in his absence. Like Fab, it took him a fair while for Klopp to trust him with meaningful minutes. And even after that it took him a fair bit longer to really get the fan on board. For the majority of that time most of the fans were underwhelmed with him as an option. It took probably until the league game against City for the fans to get on board, and he only had about 2 months after that until the injury. Similarly with Phil (as a midfielder). A lot of people seem to forget that because of his early season "injury" and then Mane's suspension and subsequent injuries, he only played behind our current front 3 a handful of times, but there are people acting like we played half a season with that line up. It was probably 3 games. You said " lot of people seem to forget that because of his early season "injury" and then Mane's suspension and subsequent injuries, he only played behind our current front 3 a handful of times, but there are people acting like we played half a season with that line up. It was probably 3 games." About half our league games last season we started with either Coutinho or Ox in a CM/AM role in the 3 man midfield. Spotty here and there but towards the end of the season Ox played there more than he didn't when our form was really improving. Its an option we've not had much this season except a game here or there with Lallana. We've done our best with CMs like Wijnaldum or Keita doing their best or dropped Firmino behind Salah for a 4231 formation. But I'd like to see what this team (with improved keeper, defence and Fabinho) can achieve with an attacking CM in the 433 formation. The way I see it after the comeback victory at St Mary's, we have no other midfielders other than Fabinho that can play the number 6 position properly. Gini is better fit than Hendo at no. 6 but it wastes his intelligence further forward. Keita, AOC ,Gini ,Henderson,Milner and Lallana are all better at the advanced midfielder position. However, Milner's contract is running out( and we shouldn't deny him the only chance for him to go back to his boyhood club) and Lallana is simply physically unreliable. Assuming both players leave, we better somehow find a DM similar to Fabinho, someone older than Fabinho and help improve Fabinho's game. Well it's a small sample size but..
Fabinho sitting with 2 marauding no.8s in Henderson and Keita looks god dam tasty. Looks to have unleashed two absolutely monsters. 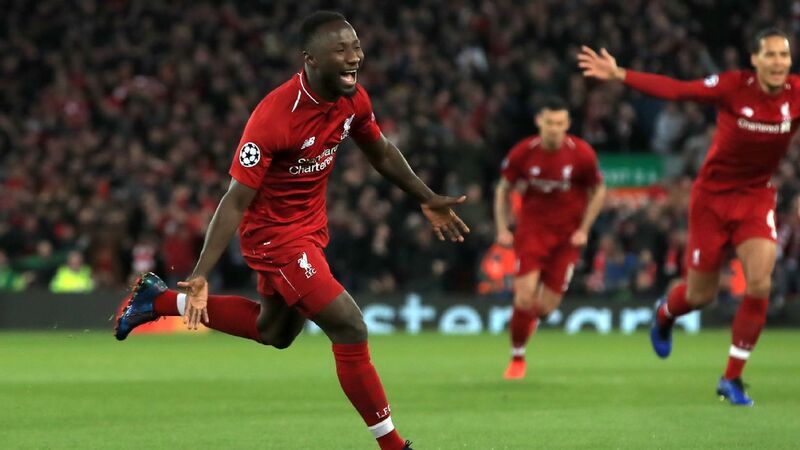 Jurgen Klopp finally seems to have found his ideal midfield trio of Naby Keita, Fabinho and Jordan Henderson. And it could win Liverpool a double. The midfield is the engine room so I’ve started to think that we don’t need an attacking number 10. Shaqiri can play that role if needed along with Firmino. I see Milner leaving this summer sadly, along with Lallana. Chamberlain worked out for us because he didn't play as a traditional attacking midfielder, he was a true box to box. He was always willing to put his foot in, press high, track runners and help the full back on his side. The 8s aren't attacking midfielders in the traditional sense, they are workhorses. If you have workhorses with the ability to hurt the opposition, that is ideal. We have never needed a true 'attacking' midfielder with Firmino in the team as he operates in those spaces himself. One of the 8s is always naturally going to be more of a threat to the opposition than the other but that doesn't make them an 'attacking' midfielder, that's just a natural consequence of players being different to each other. Our side is set up to allow the full backs to hurt the opposition, which they are consistently doing. To allow them to do that we must cover from the midfield, which we do. There is a reason this team is cruising towards the semi finals of the CL and a 90+ points total and it is not despite our midfield, how effective they have been in balancing attacking and defensive duties is one of the key reasons we have won so many games. Yeah I'm not arguing for a flat out number 10. I'm saying someone who can play that "more attacking number 8 than the other number 8" role Ox did perfectly towards the end of last season. Thats why i didnt use Firmino in the post that way and pointed out it's a 4231 when we use him there not a 433. We are doing fantastic. That doesn't mean we shouldn't improve things that are within our power to improve. If we'd had Ox all this season I believe we'd have been more comfortable in the CL group stages, gone further in the domestic cups and possibly even still had that lead over City. Having a Klopp style CM that brings attacking qualities like Ox started to would really be the extravagant icing on this exceptional cake. Jurgen has given us the answer. And with Gini, Ox and to a lesser extent Lalana and The Cube available, we're in a "good moment"
What would the starting midfield three be, assuming all our midfielders are fit and on top form (unlikely with Lallana still on the books)?